Viva Editions author Tina Gilbertson weighs in on common phrases parents should never say to their children. With the holidays coming up, it can be a time of great cheer, but also a time of great stress. To help make family gatherings less stressful, P&G Everyday shared the top five things never to say to kids, featuring advice from Tina Gilbertson, therapist and author of Constructive Wallowing: How to Beat Bad Feelings by Letting Yourself Have Them. Gilbertson suggests never telling a child to stop crying. "Stop crying or I'll give you something to cry about. Every mom has moments when she is driven to try to stop unending sobs and whining, but this oft-repeated phrase can do a lot of damage. First, you're threatening a child with some form of harm and thus calling into question their sense of safety in the world,” says Gilbertson, LPC. “Second, you're implying that the child has control over her tears and, by extension, over her feelings. In order for her to stop crying, she needs to stop feeling sad or mad,” explains Gilbertson. Controlling feelings is not something a child, or an adult, can do on cue, she says. Actress-turned-therapist Tina Gilbertson offers a practical and effective alternative to kicking yourself when you’re down. Constructive Wallowing will not only help readers reach their potential but also heal from past hurts and feel better about themselves, right this minute. It is tempting to turn away from menacing, uncomfortable feelings like anger, grief or regret and treat them like unwanted guests. However, ignoring them just seems to make them stick around. By learning to accept, rather than suppress, difficult feelings, readers will gain greater self-understanding for lifelong emotional health. 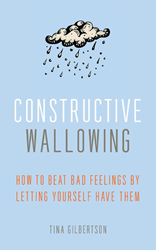 Constructive Wallowing is also available as an audiobook.